"In Central Texas House Race, Candidates Disagree on Speaker" was first published by The Texas Tribune, a nonprofit, nonpartisan media organization that informs Texans — and engages with them — about public policy, politics, government and statewide issues. GEORGETOWN — At a recent Republican forum in the Sun City community here, state Rep. Marsha Farney responded to a question about GOP House Speaker Joe Straus with a full-throated defense of the leader some conservatives view as too moderate. The remarks highlighted a key difference between Farney, a state representative since 2013, and her first-ever primary challenger, retired Army Col. Terry Wilson. Both candidates in House District 20 say they want to extend anti-abortion policies, improve public education and end "sanctuary city" policies. But while Farney promised to vote for Straus a third time if she is re-elected — drawing boos from the conservative crowd — Wilson pledged to vote against him. "Unless," Wilson said, "there's someone even more liberal." To Wilson's supporters — including conservative groups like Empower Texans and Texas Eagle Forum — Farney's backing of Straus is one sign she is not conservative enough. Empower Texans says she has worked against taxpayer protections and education reform, and Eagle Forum gave her a 54 percent rating based on last year's legislative session. Farney, meanwhile, says she's a "common-sense, pro-business conservative" who fights for retired teachers and doesn't worry about groups that compile scorecards based on lawmakers' voting records. She said she tells such groups: “My vote’s not for sale. You do whatever you want to — just spell my name right." Farney has picked up support from organizations including the National Rifle Association and the Texas Alliance for Life. But she is one of 16 House incumbents being targeted by Empower Texans — all of which have supported Straus. The organization, run by activist Michael Quinn Sullivan, sent mailers to voters in Farney's district saying her vote against an amendment in a 2015 border security bill amounted to choosing "diversity training over border security." 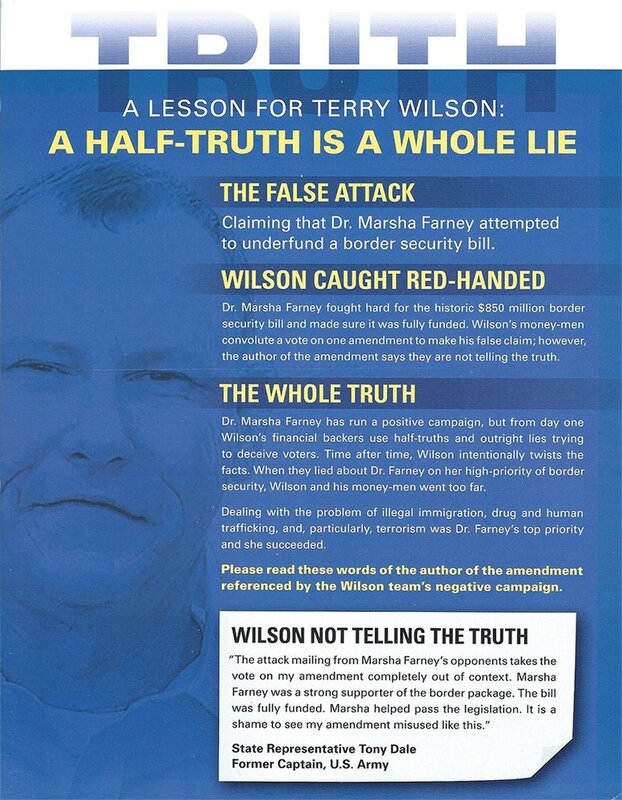 Farney’s campaign responded to the mailer with one of its own, accusing Wilson’s “Austin supporters” and “money-men” of lying about her record on border security. Wilson said the mailer appeared to distort his face, which particularly incensed him because he has undergone rehabilitation for facial disfigurement after being injured by an improvised explosive device during a deployment in 2005. State Rep. Marsha Farney's campaign sent this mailer accusing interest groups backing her opponent of lying about her record on border security. Her opponent, Terry Wilson, says the mailer distorted his face. Burnet County Judge James Oakley took to Facebook over the weekend to condemn Farney's mailer. "My issue is with a candidate that has the lack of ethical restraint that would stoop to the level of demonizing via digital alteration a family photo of a good Christian family man that is a decorated & wounded battlefield veteran to look like a freakish 'Joker' from the Batman movies," Oakley wrote. Farney said Monday she was unaware of Wilson's injuries. "Certainly I have no intention of dishonoring his service," she said. "I'm surprised people are not concerned about the distorting of facts, but only the distorting of pictures." House District 20 is large, encompassing all of Burnet and Milam counties as well as the northern part of Williamson County, which includes Georgetown. After entering the race late in November, Wilson started with a mammoth fundraising deficit. Wilson has raised $23,089, since starting his campaign, according to the most recent campaign finance reports. After spending $19,406, he was left with $3,363 on hand as January came to a close. Farney raised $20,005 over the second half of 2015 and an additional $1,450 in January. By the time Wilson entered the race, Farney already had $194,635 in her war chest. She has spent a lot since then, dispensing with $89,392 in January alone. Wilson, who has 32 years of military experience, said he wants to focus on national security issues and immigration. “I have fought terrorism for the last 14 years, and I do not want to see it here,” Wilson said. "When I left Fort Sill last June, it was nowhere on my radar to be a politician," he said at the Sun City forum, referring to the Army post in Oklahoma. "But the bottom line is you have placed me in a unique position to truly understand the plight of our nation." Jerri Jones, treasurer of the Williamson County Republican Party and a Marine Corps veteran, said that Wilson's military background is commendable, but she has endorsed Farney. "I don't see any reason why Dr. Farney should be replaced," Jones said. "I'm very pleased with her performance. She has done such a great job for her constituents, and my veteran status doesn't really fit into it." Wilson has not been afraid to confront Farney on what many in the district view as her strength: education. Farney, a former member of the State Board of Education, has a doctorate in curriculum and instruction from the University of Texas at Austin. Wilson has a master's degree in strategic logistics plans and management from the U.S. Air Force Air War College. At the Sun City GOP forum, Farney highlighted her work on providing $768 million in the 84th legislative session to fund TRS-Care, the health care plan for the Teacher Retirement System of Texas. But Wilson counters that he too has close ties to education, noting that his wife’s family includes many teachers, and he says he has worked on military contracts with universities involving research and development. In Central Texas House Race, Candidates Disagree on Speaker By Jamie Lovegrove February 16, 2016 GEORGETOWN — At a recent Republican forum in the Sun City community here, state Rep. Marsha Farney responded to a question about GOP House Speaker Joe Straus with a full-throated defense of the leader some conservatives view as too moderate. “I think it’s unbelievable how people have maligned Joe Straus,” Farney said at the Feb. 4 event. “People have been to my office saying, ‘Are you going to support that Jew?’ So I say to them, when you say ‘Jew,’ do you mean Jesus Christ? ... I will support Joe Straus, and I want you to know up front how I’m going to vote because I believe it’s important to have integrity and to be honest with you. '” The remarks highlighted a key difference between Farney, a state representative since 2013, and her first-ever primary challenger, retired Army Col. Terry Wilson. Both candidates in House District 20 say they want to extend anti-abortion policies, improve public education and end "sanctuary city" policies. But while Farney promised to vote for Straus a third time if she is re-elected — drawing boos from the conservative crowd — Wilson pledged to vote against him. "Unless," Wilson said, "there's someone even more liberal." To Wilson's supporters — including conservative groups like Empower Texans and Texas Eagle Forum — Farney's backing of Straus is one sign she is not conservative enough. Empower Texans says she has worked against taxpayer protections and education reform, and Eagle Forum gave her a 54 percent rating based on last year's legislative session. Farney, meanwhile, says she's a "common-sense, pro-business conservative" who fights for retired teachers and doesn't worry about groups that compile scorecards based on lawmakers' voting records. She said she tells such groups: “My vote’s not for sale. You do whatever you want to — just spell my name right." Farney has picked up support from organizations including the National Rifle Association and the Texas Alliance for Life. But she is one of 16 House incumbents being targeted by Empower Texans — all of which have supported Straus. The organization, run by activist Michael Quinn Sullivan, sent mailers to voters in Farney's district saying her vote against an amendment in a 2015 border security bill amounted to choosing "diversity training over border security." Farney’s campaign responded to the mailer with one of its own, accusing Wilson’s “Austin supporters” and “money-men” of lying about her record on border security. Wilson said the mailer appeared to distort his face, which particularly incensed him because he has undergone rehabilitation for facial disfigurement after being injured by an improvised explosive device during a deployment in 2005. Enlarge State Rep. Marsha Farney's campaign sent this mailer accusing interest groups backing her opponent of lying about her record on border security. Her opponent, Terry Wilson, says the mailer distorted his face. “I have been fighting the war against the insurgency, so I’m used to disinformation campaigns,” Wilson said. “But calling me a liar is the tactics of the Taliban. I expect it in Third-World countries, but I wouldn’t expect it here.” Burnet County Judge James Oakley took to Facebook over the weekend to condemn Farney's mailer. "My issue is with a candidate that has the lack of ethical restraint that would stoop to the level of demonizing via digital alteration a family photo of a good Christian family man that is a decorated & wounded battlefield veteran to look like a freakish 'Joker' from the Batman movies," Oakley wrote. Farney said Monday she was unaware of Wilson's injuries. "Certainly I have no intention of dishonoring his service," she said. "I'm surprised people are not concerned about the distorting of facts, but only the distorting of pictures." House District 20 is large, encompassing all of Burnet and Milam counties as well as the northern part of Williamson County, which includes Georgetown. After entering the race late in November, Wilson started with a mammoth fundraising deficit.&nbsp; Wilson has raised $23,089, since starting his campaign, according to the most recent campaign finance reports. After spending $19,406, he was left with $3,363 on hand as January came to a close. Farney raised $20,005 over the second half of 2015 and an additional $1,450 in January. By the time Wilson entered the race, Farney already had $194,635 in her war chest. She has spent a lot since then, dispensing with $89,392 in January alone. Wilson, who has 32 years of military experience, said he wants to focus on national security issues and immigration. “I have fought terrorism for the last 14 years, and I do not want to see it here,” Wilson said. "When I left Fort Sill last June, it was nowhere on my radar to be a politician," he said at the Sun City forum, referring to the Army post in Oklahoma. "But the bottom line is you have placed me in a unique position to truly understand the plight of our nation." Jerri Jones, treasurer of the Williamson County Republican Party and a Marine Corps veteran, said that Wilson's military background is commendable, but she has endorsed Farney. "I don't see any reason why Dr. Farney should be replaced," Jones said. "I'm very pleased with her performance. She has done such a great job for her constituents, and my veteran status doesn't really fit into it." Wilson has not been afraid to confront Farney on what many in the district view as her strength: education. &nbsp; Farney, a former member of the State Board of Education, has a doctorate in curriculum and instruction from the University of Texas at Austin. Wilson has a master's degree in strategic logistics plans and management from the U.S. Air Force Air War College. At the Sun City GOP forum, Farney highlighted her work on providing $768 million in the 84th legislative session to fund TRS-Care, the health care plan for the Teacher Retirement System of Texas. “It was due to go bankrupt in 2017, and we kept our word and fulfilled our promise,” Farney said. “I believe education is fundamental and foundational to the well-being of our state, and taking care of our teachers is a very important part of that.” But Wilson counters that he too has close ties to education, noting that his wife’s family includes many teachers, and he says he has worked on military contracts with universities involving research and development. “When I’m working on billion-dollar contracts, I’m required to get it done, so why are they doing these Band-Aids on TRS-Care?” he said. “If you had enough time to get a Band-Aid on there, you should have had enough time to get the problem fixed.”&nbsp; Disclosure: The University of Texas at Austin is a corporate sponsor of The Texas Tribune. A complete list of Tribune donors and sponsors can be viewed here. "In Central Texas House Race, Candidates Disagree on Speaker" was first published at by The Texas Tribune, a nonprofit, nonpartisan media organization that informs Texans — and engages with them — about public policy, politics, government and statewide issues. Link back to the original article, which is located at https://www.texastribune.org/2016/02/16/straus-empower-texans-play-familiar-roles-house-ra/.